Наши книжные полки обновляются каждую неделю. Следите за нашими анонсами. Сейчас на сайте 149775 книг. Welcome to Knigomania. 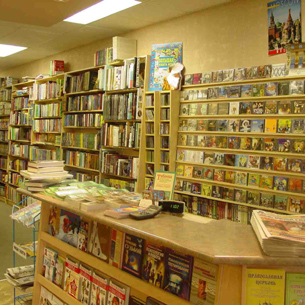 Located in Toronto, Canada, Knigomania sells a wide selection of Russian books, magazines and videos for learning and for liesure. You can buy all of our products online privately and securely. Click any of the links on this page to enter our main site, which is entirely in Russian. From within the site you'll be able to search for and buy all the russian titles we have in stock. If you're in Toronto, please visit one of our stores.